Chaucer was the police, not in an attenuated or metaphoric sense: in the better part of his mature employments, he was an official of the repressive apparatus of state. Before that, he was a lackey, in domestic personal service. As a poet, he was both, police officer and domestic servant, in differing ratios, in differing poems, at differing times in his literary career. Still, his poetic work complemented and carried through to the realm of culture the other work he did, and this quality of his poetry, being a straightforwardly homologous reflection in the cultural sphere of his practical work in personal and state service, made his place in literary history. 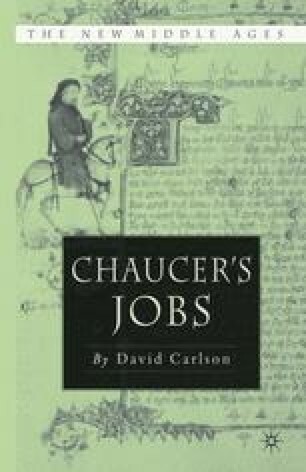 Chaucer’s jobs determined his literary-historical role, in other words, his work in service and discipline shaping his work in literature, and it in its turn determining his reception. Chaucer was made “the father of English poetry” not because he was a good poet, though he was. There were other good poets. Chaucer was made the father of English poetry because he was servile, doing useful work serving dominant social interests, materially and ideologically, in both his poetic and other employments.